What is a CR123A Battery? The CR123A battery is classified by its 34.5 x 17mm or 2/3A cell size, lithium (LiMnO2) chemistry, and high 3V voltage, making them a great choice as flashlight or lithium camera batteries. They're usually button top, and are primary (non-rechargeable) batteries. Why is it called a CR123A? Like many batteries, the name of a CR123A cell holds a lot of information about the chemistry and size. The CR indicates the chemistry of the battery, a prefix the IEC uses to denote the use of lithium chemistry, specifically LiMnO2. 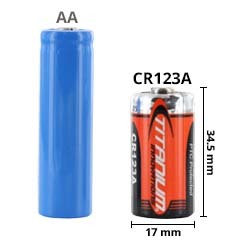 The 23A refers to the size of the battery, which in this case means the CR123A is 2/3 the length of a standard A-size battery. Are there rechargeable CR123A batteries? Yes, but they are often referred to as RCR123A or 16340 batteries. They are slightly shorter (16mm) compared to CR123As, utilize lithium-ion chemistries, and usually have lower energy capacities. It�s important to note that RCR123A batteries usually have a 3.6 � 3.7 voltage, and not all flashlights and cameras can use both CR123As and their rechargeable counterparts. You can shop RCR123As here. Can I use 2 x CR123A batteries instead of an 18650 battery? Sometimes, but not always. Some 18650 battery-powered flashlights and devices have long, spring-loaded interiors to account for varied battery length, allowing 2 x CR123A batteries to squeeze in. 18650s are slightly thicker than CR123As, so you may need a battery sleeve for a secure connection. We always indicate whether our flashlights can accommodate multiple battery sizes so you don�t buy the wrong size cell, and you can shop for CR123A flashlights here. Why do I see names like EL123A, 123A, and K123LA? These are just variants of CR123As, which may be referred to as 123, 123A, CR23, and more. Some manufacturers brand their batteries, like Duracell�s DL123A and Energizer�s EL123A. You can read more about CR123A cells and other batteries over at our Battery Guide. These high-powered batteries are idea from everything from digital cameras to ultra-bright flashlights! CR123A cells utilize advanced lithium technology to generate 3.0 volts to power your high-energy devices.